ArchitectureWeek No. 526 is now available on the Web, with these new design and building features, and more. Israel Asper, the media magnate who envisioned the museum, wanted a place where Canadians could "look beyond ourselves, and our parochial interests, to reach for the stars and create an iconic structure that would symbolize Canada's commitment to human rights," according to his widow, Babs Asper. Canada's fifth national museum, and the first to be located outside the national capital of Ottawa, the Museum for Human Rights is presently under construction in Winnipeg, the provincial capital of Manitoba, on a historic site called the Forks at the junction of the Red and Assiniboine Rivers, where First Nations people once met peacefully to resolve disputes. Saudi Arabia's Kingdom Holding Company has revealed the design for Kingdom Tower in Jeddah, Saudi Arabia, slated to become the tallest building in the world. 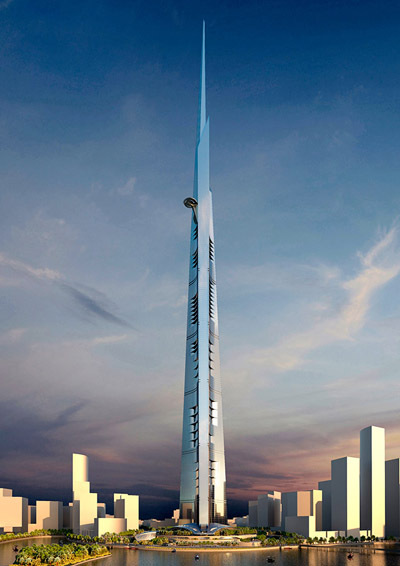 The supertall tower will be at least 173 meters (568 feet) taller than the current record-holder, the Burj Khalifa in Dubai, United Arab Emirates, which is 828 meters (2,717 feet) tall. Adrian Smith + Gordon Gill Architecture (AS+GG) of Chicago, Illinois, is leading an interdisciplinary design team that includes Thornton Tomasetti as structural engineering consultant and Environmental Systems Design, Inc. (ESD) as building services engineering consultant. 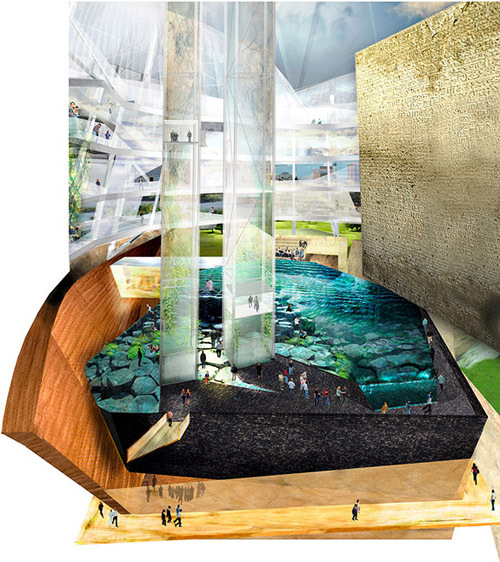 Adrian Smith previously designed the Burj Khalifa while at Skidmore, Owings & Merrill (SOM). Kingdom Tower's slender, subtly asymmetrical massing was inspired by the folded fronds of young desert plant growth, according to the architects. The three-petal footprint is well suited to residential units, and the tapering wings will produce an aerodynamic shape that helps reduce structural loading due to wind vortex shedding. The project will feature a high-performance exterior wall system and a series of notches that create pockets of shadow and provide outdoor terraces. The mixed-use tower will include a Four Seasons hotel, Four Seasons serviced apartments, Class A office space, luxury condominiums, and a record-high observation deck. At level 157, a sky terrace roughly 30 meters (98 feet) in diameter will provide outdoor amenity space for use by the penthouse floor. The 530,000-square-meter (5.7 million-square-foot) tower project will be the centerpiece and first construction phase of Kingdom City, Jeddah Economic Company's new urban development on over 530 hectares (1,310 acres) of land in north Jeddah, near the Red Sea. The overall Kingdom City master plan is being designed by HOK, while AS+GG designed the master plan for the 23-hectare (57-acre) Kingdom Tower Waterfront District surrounding the tower. This new project would become the Whitney Museum of American Art that we know today. 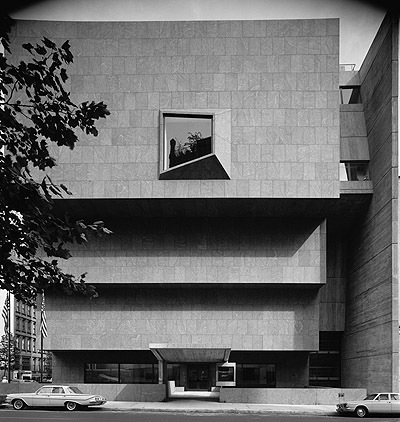 Not only a radical design, Breuer's building would become an architectural icon of New York City and a symbol of the radicalism and controversy that would surround much of the Whitney Museum's activities and commitment to often controversial trends in contemporary art (perhaps best encapsulated in the Whitney's biennials). The new location on the Upper East Side would place the Whitney Museum in the "Museum Mile" district of Manhattan. 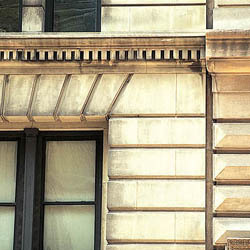 Though one block east of the "mile" itself (the Whitney would be on Madison Avenue rather than Fifth Avenue), it would be five blocks north of the Frick Collection on 70th Street and Fifth Avenue (more or less the southernmost of the museums of the district) and seven blocks south of the main entrance of the Metropolitan Museum of Art on 82nd Street. Address your workflow needs, better predict performance, and manage outcomes before construction begins. 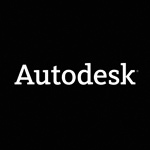 Learn how to maximize the value of your investment in BIM software with Autodesk Building Design Suite Premium, a comprehensive set of tools in a single economical and convenient package. Download a basic guide to PassivHaus design, an ultra-low-energy construction standard used in the U.S. and Europe. Through insulation, airtightness, and heat-recovery ventilation, buildings can be designed and built to reduce heating energy needs up to 90 percent compared to the existing building stock, while maintaining high indoor air quality. Z Corporation offers a white paper that discusses the inception and evolution of 3D printing, explores in depth how a 3D printer produces a physical model, and examines the defining attributes of a Z Corporation 3D printer and the technology decisions that produced them. Construction Specialties (C/S) offers the Acrovyn® 4000 line of PVC-free interior wall and door protection. 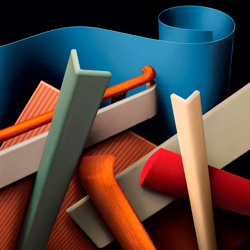 The product line includes handrails, crash rails, corner guards, door and frame protection, wall panels, and wall covering, all Cradle to Cradle-certified at the Gold or Silver level. The new modified PETG (glycol-modified polyethylene terephthalate) formula offers the same impact resistance and UL Class 1 fire rating as the original Acrovyn, and costs no more. Contains no polyvinyl chloride (PVC), persistent bioaccumulative toxins (PBTs), bisphenol A (BPA), or halogenated fire-retardants. New contemporary, low-profile textures and a lower gloss level improve the aesthetics, cleanability, color consistency, and end-cap-to-profile match. Completely recyclable. "Your online images appear the best." Connect each of the following pre-Columbian sites with the culture that created it. You are designing a house near a creek and are concerned about flooding. An expert tells you that the site is unlikely to suffer from headwater flooding but that you might want to raise the building or set it back from the creek because of the possibility of a backwater flood. What is the difference between these two types of flood? ""Here is a bungalow of unusually attractive design and plan. It is especially suited to the country but would look well in a suburban location, though it would need a good-sized site to enable its full beauty to be seen. 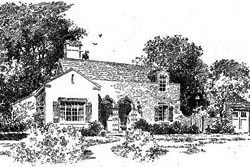 A garage is suggested in the illustration, tied into the house by a brick wall. In this arrangement, the garden and lawn would be at the opposite end with a terrace outside the living room windows... "